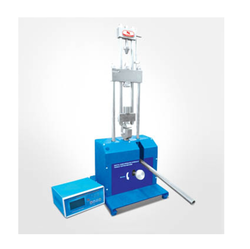 Hand Operated Tensile Testing System, the two column frame with a hand wheel operated lead screw is a perfect tool for tension, compression and flexural testing of springs, rubber, paper, film etc., with apt attachments. These are appreciated for their durability, accuracy of results and high tensile strength. 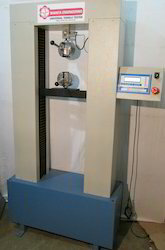 It is a better Tensile Tester Machine having a variety of applications. Feather touch Key board operation. A.C. Drive Speed 5 mm / min. to 100 mm / min. OR 30 mm / min. to 500 mm / min. A.C. Servo Drive Speed 1 mm / min. to 500 mm / min. The load cell of different capacities is available as optional items. Displacement resolution of 0.1 mm is optional. Compression, Bending & flexural attachment to suit specific tests are available as optional. To view, the specifications of other models click on Download option.